What is purple-bordered leaf spot? Purple-bordered leaf spot (also called eye spot or Phyllosticta leaf spot) is a common, but primarily cosmetic disease that affects maples (in particular Amur, Japanese, red, silver and sugar maple). Phyllosticta leaf spot is similar in many ways to other foliar diseases of maple such as anthracnose (see University of Wisconsin Garden Facts XHT1001) and tar spot (see University of Wisconsin Garden Facts XHT1126). What does purple-bordered leaf spot look like? Purple-bordered leaf spot leads to the formation of roughly circular dead areas (typically less than ¼ inch in diameter) on maple leaves. Spots have tan to brown centers and distinct purple, red, or brown margins. Tiny, black, pimple-like reproductive structures (called pycnidia) often form within the spots, and are diagnostic. As spots mature, the centers may fall out, leaving roughly circular holes. Where does purple-bordered leaf spot come from? Purple-bordered leaf spot is caused by the fungus Phyllosticta minima which overwinters in leaf litter. In the spring, rain and wind move spores of the fungus from the leaf litter to newly developing maple leaves, where infections occur. Spores produced on infected leaves can lead to additional infections within the tree canopy throughout the growing season. How do I save a tree with purple-bordered leaf spot? DON’T PANIC. Although purple-bordered leaf spot may look unsightly, the disease is usually only a cosmetic problem, rarely causing significant damage to mature and vigorously-growing trees. Occasionally, the disease may defoliate trees early in the growing season, but these trees are typically able to produce new leaves within a few weeks. Defoliated trees should be watered (about one inch of water per week), and properly fertilized (based on a soil nutrient test). How do I avoid problems with purple-bordered leaf spot in the future? 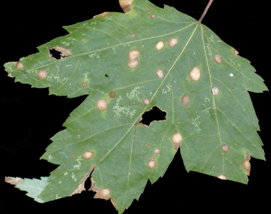 If available, select maple varieties that are resistant to purple-bordered leaf spot. Compost, bury or burn leaf litter from infected trees in the fall, or in the spring before trees releaf. Newly planted maples, and established maples that have been severely affected by purple-bordered leaf spot for several years, may benefit from treatments with a fungicide containing chlorothalonil, copper, mancozeb, neem oil, sulfur or thiophanate-methyl. Three treatments may be needed for adequate control: one at bud break, one when leaves are half expanded, and one when leaves are fully expanded. Be sure to read and follow all label instructions of the fungicide that you select to insure that you use the fungicide in the safest and most effective manner possible. Within the leaf spots, small, black, pimple-like fungal fruiting bodies form (red arrows).